Balikun horses are a rare light draft breed from the Xinjiang region in northwest China. They are well adapted for harsh environment and used mainly for transportation. They are able to survive on steppe hills and and pasture with harsh temperatures as low as 40 degrees below zero. 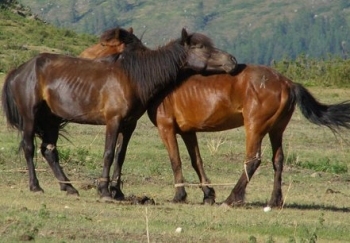 Balikun horses developed from Kazakh and Mongolian horses; however, over 200 years of selective breeding has made the Balikun horse a breed of its own. Balikun horses stand, on average, from 12.2 to 13.1 hands. They have heavy heads with short, thick, muscular necks. Their withers are often rather low, and the backs are short, flat, and very strong. Their shoulders are straight, but muscular. Their croup is sloped, with their tail being low-set. They have very strong quarters, and would have no problem carrying over 200 pounds all day. Balikun horses come in bay and chestnut. Balikun horses have a willing and able attitude. They are used for transportation, farm work, and draft.